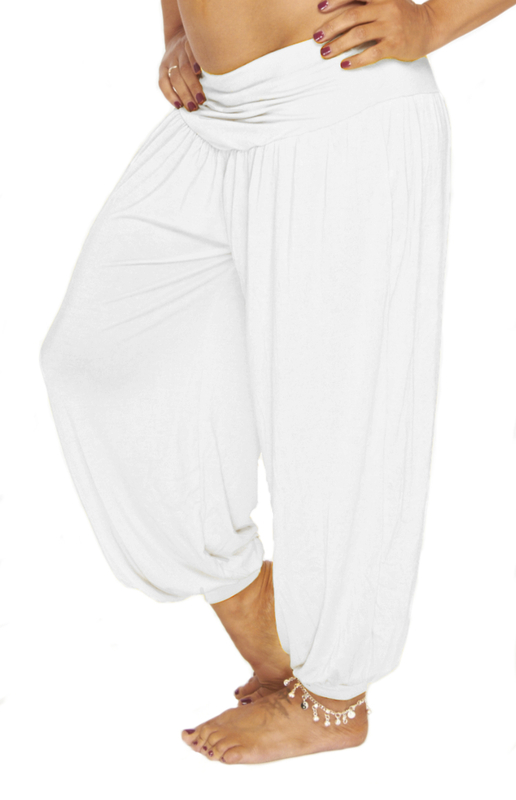 Soft, stretchy material and a flattering cut make these harem pants a great choice for dance class or weekend wear. One size. Soft, stretchy rayon blend jersey material and a flattering cut make these harem pants a great choice for dance class or weekend wear. Hand wash cold or machine wash gentle, cold cycle; hang or lay flat to dry. APPROXIMATE MEASUREMENTS: Waistband (High Hip)- 27 inches unstretched, 38 inches stretched; Low Hip- 36 inches unstretched, 46 inches stretched; Inseam- 25 inches. A: Hi Pam, Thank you for your question. These pants are a matte fabric and are not sheer. Product details and measurements can be found in the Description box located below the photo on the product page. For another view of these pants, please look at product #7527 (click on the photo and you will see additional photos below the main image). They are the same style and fabric, just a different color. I hope this helps.